To Cite: Zarrin B, Haghjooy Javanmard S, Samani F, Tajadini M, Jamady M, et al. The Effect of Duloxetine on Tau Protein and Migration in Breast Cancer Cell Line, Int J Cancer Manag. 2017 ; 10(5):e6422. doi: 10.5812/ijcm.6422. Background: Metastasis is one the most important causes of death among the patients diagnosed with breast cancer. Tau protein is a cytoskeletal protein which competes with paclitaxel and attenuates its effects. So increased tau protein may promote metastasis progression. Duloxetine is an antidepressant inhibiting serotonin, norepinephrine reuptake. In this study we tried to investigate the effects of duloxetine in tau gene expression in breast cancer cell line. Methods: Duloxetine was prepared with the doses of 2, 20 and 100 µM per litter. MCF7 (Michigan Cancer Foundation-7) cell line was treated for 24 hours. The toxicity of duloxetine was estimated by 3-(4, 5-dimethyl-2-thiazolyl)-2, 5-diphenyl-2-H-tetrazolium bromide (MTT ) assay and the extent of tau protein expression was evaluated by quantitative real-time polymerase chain reaction (qRT-PCR). Results: Statistically all concentrations of duloxetine significantly decreased cell viability in comparison to control groups. However, paclitaxel showed more cytotoxicity effects. According to the results of qRT-PCR, tau expression increased at 20 and 100 µM concentration of duloxetine. Conclusions: It seems that duloxetine, a drug for pain relief in patients with cancer, should be used with caution for metastasis promotion in breast cancer patients. Breast cancer, one of the most prevalent cancers through the world, is the main cause of cancer death among the women (1). According to recent studies about 40% of all breast cancer patients are at high risk of recurrence. The first 2 - 3 years is the most probable period for the recurrence (2). A family of microtubule associated proteins (MAPs), known as Tau proteins, is responsible for the assembly of tubulin monomers into mirotubules (MTs) for neuronal microtubules network constitution (3). Classically, tau is characterized as a neuronal MAP, where it is involved in neurite outgrowth and tauopathies (4). These structural proteins ensure mocrotubule maintenance (5). Interconnection of tau proteins between microtubules and other cytoskeletal components may cause flexibility restriction of the microtubules (3). Alteration in MT dynamics, which is highly regulated by several MT-related proteins, results in inhibition of tumor progression and angiogenesis (6). Paclitaxel, the first line of breast cancer chemotherapy, interferes with spindle microtubule dynamics causing cell cycle arrest and apoptosis. Protein Tau, one of microtubule-associated proteins, interacts with paclitaxel as both bind to beta-tubulin in the same point (7). Recently, attention has been given to tau protein as predictors of paclitaxel sensitivity and patient relapse (8, 9). According to previous studies, selective serotonin reuptake inhibitors (SSRIs) demonstrate anti-proliferative and proapoptotic activities. They also ameliorate tau levels and its hyper phosphorilation (10, 11). The mechanism through which SSRIs prevents cells from proliferation is arresting the cells at G0/G1 stage and stimulating DNA fragmentation (12). Duloxetine is a serotonin (5-HT) and norepinephrine (NE) dual reuptake inhibitor (SNRI) which is effective in treating cancer neuropathy-related pain (13). There is no data available on anticancer effects of this drug, so in this study we are going to investigate the effect of duloxetine on tau expression, cancer migration and synergistic effects with paclitaxel in breast cancer cell line. This experimental in vitro study has been performed in applied physiology research center, in Isfahan university of Medical sciences. Human MCF7breast carcinoma has been used in our study. 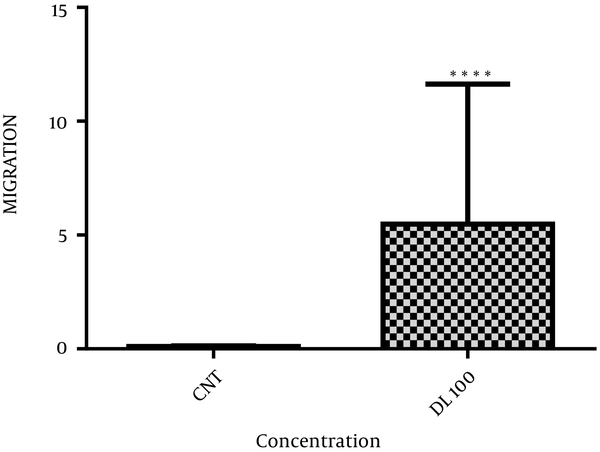 human MCF7 cells were obtained from Pasture institute of Iran and were grown as monolayer culture in Dulbecco’s modified Eagle’s medium (DMEM, USA) supplemented with 10% fetal bovine serum (FBS, USA), penicillin (100 U/mL), and streptomycin (100 μg/mL). All cells were incubated at 37°C in 5% CO2, under humidified air with 5% at 37°C. When the confluence was 70% - 80% (every two or three days) the cells were passed using 0.25% Trypsin- 1 µM EDTA solution followed by centrifugation (4 minutes, 1500 rpm) and replaced in T75 culture flasks at a sub-cultivation ratio of 1:10 to ensure optimal proliferation. Duloxetine and paclitaxel were dissolved in pure dimethyl sulfoxide (DMSO). The studied concentrations were prepared in DMSO in final volumes that represent less than 1% of the total medium volume. Cell viability was evaluated by 3-(4, 5-dimethyl-2-thiazolyl)-2, 5-diphenyl-2-H-tetrazolium bromide (MTT) assay. For this purpose, MCF7 cells were seeded on 96-well culture plates at 1 × 104 cells/well and treated with increasing concentrations of duloxetine alone ranging from 2, 20 and 100 µM and paclitaxel along with 100 nM concentration for 24 hours at 37°C. Furthermore, in order to assess the synergistic effect of paclitaxel and duloxetine, the cells were treated with both drugs concomitantly. At the time of assay, cells were washed with PBS and incubated with 10 μL of 0.5 mg/mL MTT reagent in medium for 3 hours at 37°C. Formazan crystals formed by living cells were then dissolved in 50μl of DMSO per well. The optical density (OD570-650) was then read by Multi-Detection µplate reader (BioTek Instruments, Inc.; Winooski, VT). Total RNA was extracted from breast cancer cells by using RNA Mini plus Kit (Qiagen, Valencia, CA, USA) according to the manufacturer’s protocols and cDNA was synthesized by using Revert Aid TM Reverse Transcriptase (Fermentas, Vilnius, Lithuania) with oligo-dT primers. Quantitative real time RT-PCR was performed by using specific primers for tau targets and GAPDH as an internal house keeping control with the SYBR Green qPCR Master Mix (Fermentas, Vilnius, Lithuania) and run in the Rotor-gene 6000 (Corbett Life Science, Sydney Australia ). The PCR cycling conditions for the genes consisted of an initial denaturation at 95°C for 10 minutes, followed by 45 amplification cycles including denaturation at 95°C for 15 seconds, annealing at 60°C for 30 seconds and an extension at 72°C for 30 seconds.The amplification efficiencies were tested for the genes of interest, tau, and housekeeping gene. These measurements were then plotted against cycle numbers. The parameter threshold cycle (Ct) defined as the cycle number at which the first detectable fluorescence increased above the threshold observed For fold-changes calculation in relative gene expression, equation ΔΔCT, where ΔCt = Ct (Target Gene) - Ct (GAPDH) for each treatment was used. For the migration assay, a total of 3 × 104 cells were seeded in the top chamber of the transwell with a noncoated polycarbonate membrane (6.5 mm diameter insert, 8.0 μm pore size). DMEM medium with 10% FBS was added to the lower chamber as a chemo attractant. After incubation for 24 hours, Cells that did not migrate through the pores were mechanically removed by a cotton swab; whereas the Cells that migrated to the lower side were detected by crystal violet staining (mean ± SEM, n = 3). Data are reported as the mean ± standard error of the mean (SEM) and followed normal distribution of independent experiments, which were done at least three times, each time with at least three independent observations. Statistical analysis was performed using one sample t-test and one-way ANOVA test. P values less than 0.05 were considered significant. Prism 6 software was used to analyzing data. 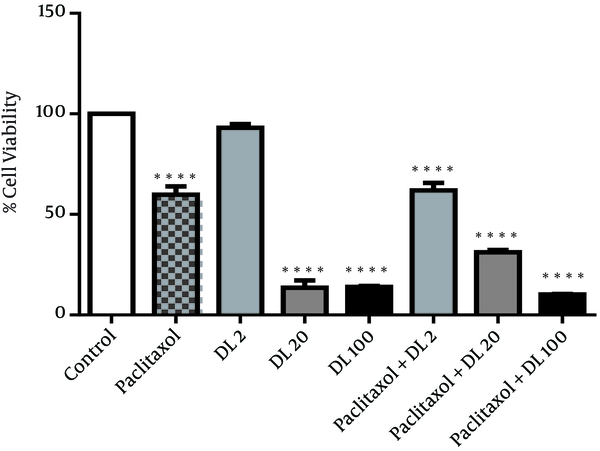 Figure 1 shows the effect of duloxetine and paclitaxel on cell viability. All treatments including duloxetine and paclitaxel alone and also synergistic treatments, showed significant toxicity on breast cancer cells in comparison to the control group whereas low concentration of duloxetine did not have any significant effects on cancer cells viability. MCF-7 breast cancer cells were treated with dulexetine and paclitaxel and the viability of cells was evaluated by MTT assay. The data are expressed as the percentage of cell viability. Data shown are the mean ± SEM (n = 3). P < 0.0001. Comparison of two studied factors in dulexetine treated groups A, tau gene expression; B, stathmin gene expression. Each graph has been represented as mean ± SEM. *** P < 0.001 and ** P < 0.01 in compare with control group. Figure 3 demonstrates transwell migration assays. 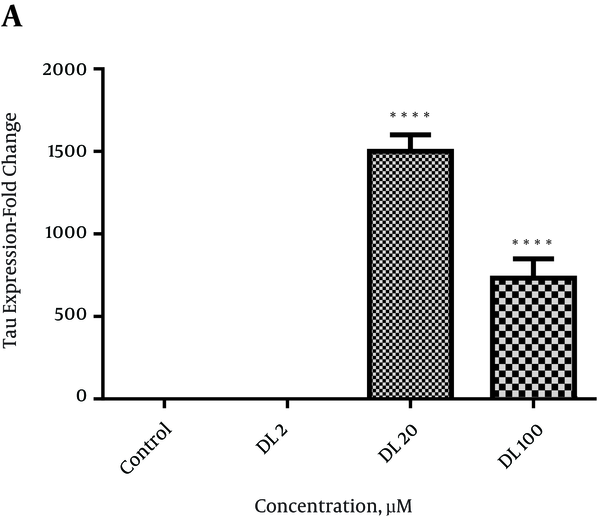 Duloxetine at the concentration of 100 µmol/L increased the number of migrating cells (P < 0.0001) compared with the control group. Data are shown as mean ± SEM. In this study we tried to evaluate the effect of duloxetine on cancer migration and tau expression. Duloxetine decreased cell viability and tau expression in a dose-dependent manner; however, at the highest dose, it increased MCF 7 migration. Cytoskeleton rearrangements affect cancer progression, and can be identified in each cytoskeleton system and their accessory factors (14). Consequently, MAP expression can greatly affect the efficacy of microtubule-targeted therapies, such as the anti-mitotic drugs, Vinca alkaloids and taxanes (15). MAP tau was identified as the most differentially-expressed gene; identify predictive markers of pathologic complete response to paclitaxel (Taxol) in breast cancer patients (16). The use of duloxetine among patients with painful CIPN leads to a great reduction in pain (17). Several antidepressants such as selective serotonin-reuptake inhibitors and serotonin norepinephrine reuptake inhibitors possessing potent apoptotic activity and showed cytotoxic effects in different cell lines. According to our results, duloxetine and paclitaxel showed significant toxicity in breast cancer cells separately and synergistically. The apoptotic activity of these antidepressants is through activation of p-c-Jun and subsequent increased Cyt c mitochondrial release (2). Decreased [3H] thymidine incorporation, increased activity of the caspase-3 enzyme and decreased Bcl-2 proto-oncogene expression cause the cytotoxic effects mediated by antidepressants (3). However some studies have shown increased risk of breast/ovarian cancer with the use of antidepressants (5). Prolactin is a tumor-promoter that stimulates proliferative activity in the mammary gland, suppresses apoptosis and upregulate the BRCA1 (breast cancer 1) gene (6). Mitotic and cytoskeleton microtubules are more sensitive to disruption by paclitaxel as a result of low levels of Tau protein expression. MAP-Tau gene expression is induced by ER leading to sensitivity modulation of malignant cells to taxanes (11, 12). It has been suggested that the expression of neuronal MAPs in non-neuronally-derived cancers speak to their origin from stem cell-like precursor (15). We showed here that high doses of duloxetine increased tau expression and metastasis significantly. In conclusion, duloxetine decreases cell viability but enhances cell migration which may affect the cancer relapse in patients, so further in vivo studies may address this question. This work was performed in applied physiology research center and supported financially by Isfahan University of Medical Sciences.